The obscure mealybug (Pseudococcus viburni) has been confirmed for the first time in Connecticut. High populations were present on numerous host plants in a Connecticut nursery in the fall of 2015. Samples were submitted to the UConn Plant Diagnostic Lab for identification by Donna Ellis, UConn Nursery IPM. Specimens were sent to entomologists at the Smithsonian Institution in Washington D.C. to be identified. The obscure mealybug has a broad host range that includes both woody and herbaceous plants and is an important pest in some grape growing areas in California. It is thought to be native to South America and, according to some reports, Australia. The first report in California was as early as the late 1800s. The obscure mealybug has been reported from Vermont as a greenhouse pest so it may have been overlooked or unreported previously in Connecticut and other New England states. Mealybugs can easily be moved to new areas on infested plant material. 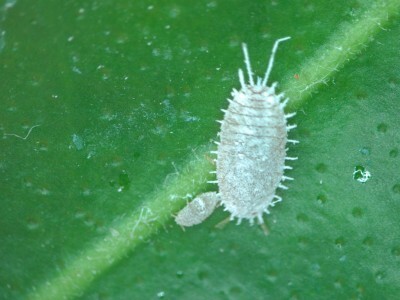 The adult females are similar in appearance to the citrus mealybug (Planocccus citri) but lack the faint stripe on the back and have longer ‘tail’ filaments. The longer tails can make some people confuse this mealybug with the longtailed mealybug (Pseudococcus longispinus) but in that species the tails are much longer than the body. In addition, the citrus and obscure mealybugs both lay eggs in cottony sacs, but the longtailed mealybug produces live young. Crawlers (nymphs) can be dispersed throughout a greenhouse on air currents, workers, water, and ants. Ants feed on honeydew produced by the mealybugs and may defend them from enemies as they sometimes do with aphids. The obscure mealybug is present throughout the year in all life stages and outdoors will overwinter in protected places such as under bark scales. 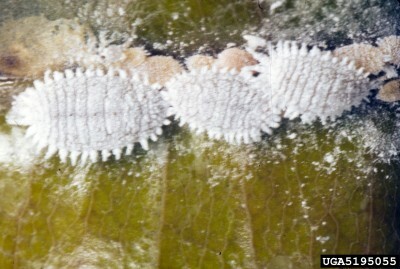 Obscure mealybug look-alikes: Citrus mealybug, left, has a faint stripe down the back (photo credit: J. Lotz, FL Dept. of Agric. and Cons. Serv., Bugwood.org). The longtailed mealybug has tail filaments longer than the body (photo credit: D. Cappaert, MI State Univ., Bugwood.org). Mealybugs can be difficult to control. Because they prefer to congregate in plant nooks and crannies they can be protected from applications of contact insecticides. Biological control agents including parasitic wasps, some lady beetles, and lacewings can play an important role in control but not all are commercially available. 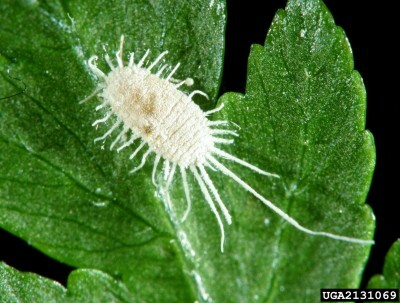 The obscure mealybug has the ability to encapsulate the eggs of some potential parasites. Biorational options include oils (Suffoil X, horticultural oil) and insecticidal soap. High pressure water sprays can be used on sturdy plants. Neonicotinoids (category 4A) are effective for some mealybugs but can be slow acting. Safari is more water soluble than others and will be faster acting. Mealybugs can develop resistance to insecticides so avoid repeated use of products in the same category. Sanitation is important in mealybug management. Inspect incoming plant material to avoid introducing pests. In the greenhouse, infestations can be cleaned up by keeping the house free of plants for at least 60 days (the life cycle of some mealybugs). If infestations are light, spot treat with oil or soap products. Some growers have success with spraying first with insecticidal soap to break down the waxy filaments and then follow up with an oil spray the next day. Phytotoxicity may occur on some plant species and at certain temperature and/or humidity conditions. Do a spot test application and observe for injury after 48 hours. Heavily infested plants should be discarded. Consult and follow pesticide labels for registered uses. To avoid potential phytotoxicity problems, spot test before widespread use. No discrimination is intended for any products not listed.